The final death toll of the building that collapsed on Sunday night in Achrafieh in Al-Motran Atallah Street in Fassouh is still unknown. Rescue operations are still being carried out to dig through debris trying to remove bodies from the rubble. So far, rescue workers have removed 26 bodies. Rescuers managed to free 11 survivors with various injuries. It is believed that 18 residents are still buried in the rubble. The Acting Director of the General Security General Brigadier Raymond Khattar also told LBCI that around 50 people were inside the building the moment it collapsed. Gladys Naim, one of the building’s residents, told LBCI that the building’s owner Michel Saadeh, who is still under investigation, advised residents Sunday morning not to spend the night in the run-down building. Exclusive sources told LBCI, Sunday night, that two buildings located near the building that fell to the ground were evacuated by the security forces. 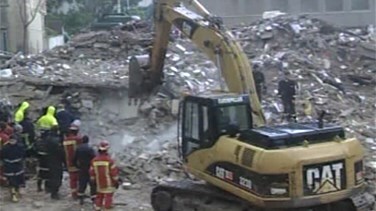 LBCI contacted several officials closely related to the building collapse. Architect Elias Hadaya from the architecture department in Beirut municipality said that the building that collapsed on Sunday was built in 1976, adding that they received no complaints regarding the safety of this building. The Mayor of Beirut Bilal Hamad reassured LBCI viewers that during the urgent meeting called for on Monday they will discuss the issue of old buildings. However, he stressed that the municipality does not intervene unless it receives a complaint from the owner or the tenant. The Head of the Public Works Parliamentary Committee Mohammad Qabbani also told LBCI that it is very important to raise awareness amongst people, emphasizing the need to establish a disaster management body that the committee has been calling for, for the past 10 years. “We will not wait any longer, we will submit an urgent draft law on this issue”, Qabbani said.